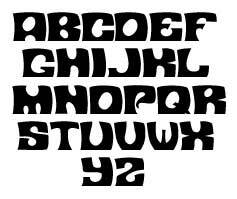 Rugby Font is a typeface based upon the lettering style used by the British psychedelic/drone band Spacemen 3 for their first couple of albums from 1986-1989. The lettering originally appeared on concert flyers in the late sixties and on some releases from the era (Shocking Blue, The Beach Boys, The Stooges, and more). The earliest known use I’ve spotted was in the opening titles of Sergio Leone’s spaghetti western For A Few Dollars More. For many years, the typeface was known as “Contest” and was available as dry transfer lettering from the Mecanorma catalog. I suspect it’s this version that the band used. Transfer lettering is long-dead these days, but the Mecanorma version is still available. In keeping with the old tradition of naming Macintosh fonts after cities, I named the font “Rugby” after Spacemen 3’s hometown in the UK. Rugby Font is freeware, though if you use it and like it – please drop me a line, send me a postcard, etc. etc. 1.0.2 (26 October 2017): Converted art files to Glyphs and added OpenType version.